On January 6, 2019 local time, State Councilor and Foreign Minister Wang Yi held talks with Foreign Minister Sidiki Kaba of Senegal in Dakar. Wang Yi expressed that President Xi Jinping's historic visit to Senegal last year was a great success, which enhanced mutual trust and deepened friendship. Under the strategic guidance of the two heads of state, China-Senegal relations have developed in a constant and in-depth manner. Senegal took the lead in signing cooperation documents on the Belt and Road Initiative with China in West Africa, and now serves as the co-chair of the Forum on China-Africa Cooperation (FOCAC), which has opened up new areas for and added new connotations to the relations between the two countries. The Chinese side is willing to intensify cooperation with the Senegalese side to boost the development of the FOCAC and China-Africa comprehensive strategic partnership by the robust China-Senegal relations, and promote the implementation of the outcomes of the FOCAC Beijing Summit as soon as possible. The Chinese side appreciates that Senegal has always understood and supported the Chinese side's just stances on issues concerning China's core interests, and will continue to firmly support the Senegalese side's efforts in following a development path that is suitable to its national conditions and safeguarding its legitimate rights and interests. It is hoped that both sides will constantly increase political mutual trust so as to consolidate the solid foundation and provide stronger impetus for deepening practical cooperation. The Chinese side stands ready to actively promote the construction of the agreed infrastructure projects and expand cooperation in industrial parks and other emerging fields in accordance with the needs of the Senegalese side. 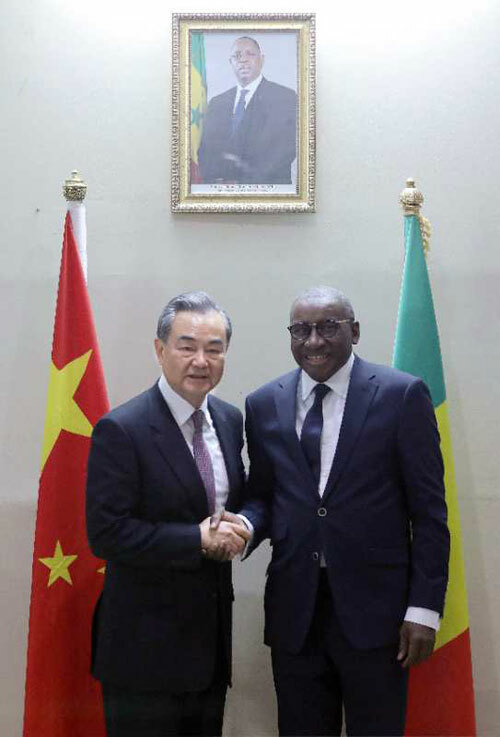 Meanwhile, on the basis of fully respecting the willingness of the Senegalese side, the Chinese side is ready to explore conducting trilateral or multilateral cooperation in areas of the concern of the Senegalese side to realize mutual benefit and win-win results. Wang Yi said that China has just celebrated the 40th anniversary of reform and opening up. After four decades of efforts, China has not only achieved its own rapid development, but also exerted significant and positive influence on global peace and development. As China further develops and becomes stronger, it will have more capabilities and resources to help and support other developing countries. At present, given the fact that multilateralism is being challenged, it is even more necessary for China and Africa to strengthen the awareness of a community with a shared future, unite and cooperate with each other, and well safeguard the legitimate rights and interests of developing countries. The Chinese side is willing to work with the African side to step up effective alignment between the eight major initiatives and the development strategies of various African countries, translate the signed cooperation documents on the Belt and Road Initiative into concrete actions, and provide assistance within its capacity for Africa to improve capacity for independent development as well as safeguard peace and security. Sidiki Kaba noted that Senegal-China relations are of strategic and comprehensive significance. China is an important strategic partner of Senegal and also a friend who truly cares about the development of Senegal. Under the brilliant leadership of President Xi Jinping, China has successfully lifted more than 700 million people out of poverty, achieved great development achievements, and made important contributions to global peace and stability, for which the Senegalese side highly appreciates and admires. The current high-quality development of Senegal-China relations with rich content has yielded remarkable achievements, with major infrastructure projects such as highways gradually completed or advanced, which has played an important role in the development and revitalization of Senegal. The Belt and Road Initiative and the eight major initiatives proposed by President Xi Jinping highly match with the Agenda 2063 of Africa, and the Plan for an Emerging Senegal put forward by President Macky Sall, which is conducive to realizing mutual benefit and win-win results between China and Africa. The Senegalese side will accelerate their alignment and vigorously promote them. The Senegalese side reiterates its adherence to the one-China principle. The Senegalese side will closely work with the Chinese side to jointly well fulfill the duties as the co-chairs of the FOCAC, advance the mechanism building of the FOCAC and well implement the outcomes of the Beijing Summit, so as to play a positive role in Africa-China comprehensive strategic partnership.